When is the Best Time to Visit Costa Rica for Vacation? When you’re planning your Costa Rica vacation, you not only have to think about where to go in Costa Rica, but the best time of year to visit Costa Rica as well! 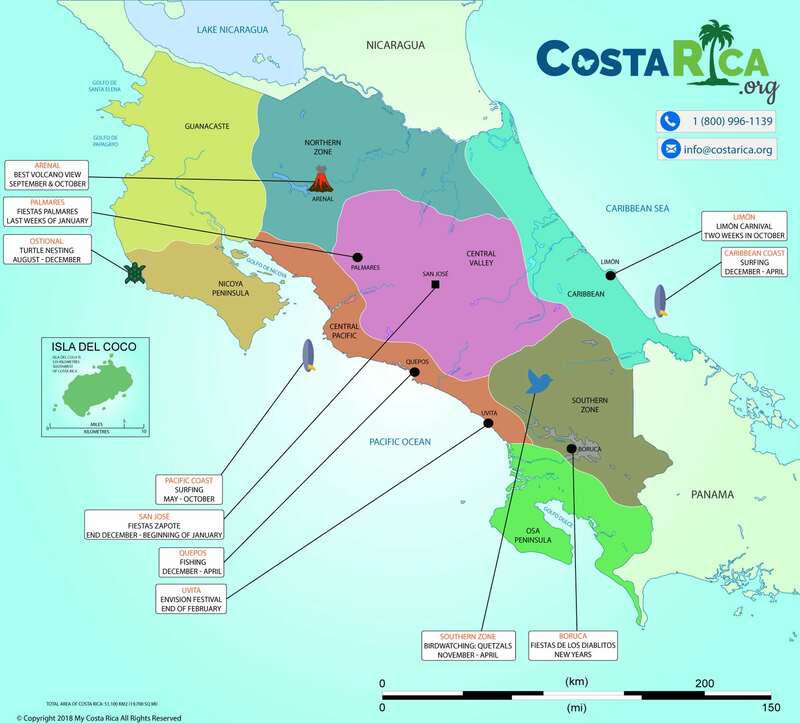 Luckily My Costa Rica is an expert on Costa Rica tourism and can help you decide the best time to travel to Costa Rica. The best time to visit Costa Rica depends on where you want to go! Costa Rica climate and seasons vary by region. There are two primary seasons in Costa Rica, the rainy season and the dry season. The dry season (or high season) is wonderful. For most of the country, the Costa Rica dry season is from December to April and it is a fantastic time to visit. You have a smaller chance of being drenched in the rain and you can enjoy the sunny weather. Costa Rica in December, for example, is beautiful. Imagine the best day of Spring. That is what the weather is like every day. The rainy season (AKA “green” season) is an incredible time travel to Costa Rica as well. It is generally from May to November. Hotel rates and tour prices are significantly lower and the country turns a wonderful deep green. Furthermore, the Costa Rica rainy season is a great time to visit because some of Costa Rica’s famous attractions (active volcanoes like Arenal, Poas, Rincon de la Vieja, Irazu) are very visible. So you see, visiting Costa Rica comes with a lot of planning! This is why we are here to guide you during your trip to Costa Rica! Costa Rica weather is defined by two seasons and they are called the dry, or peak season, and the green season, or wet season. As mentioned before, Costa Rica climate varies by region. 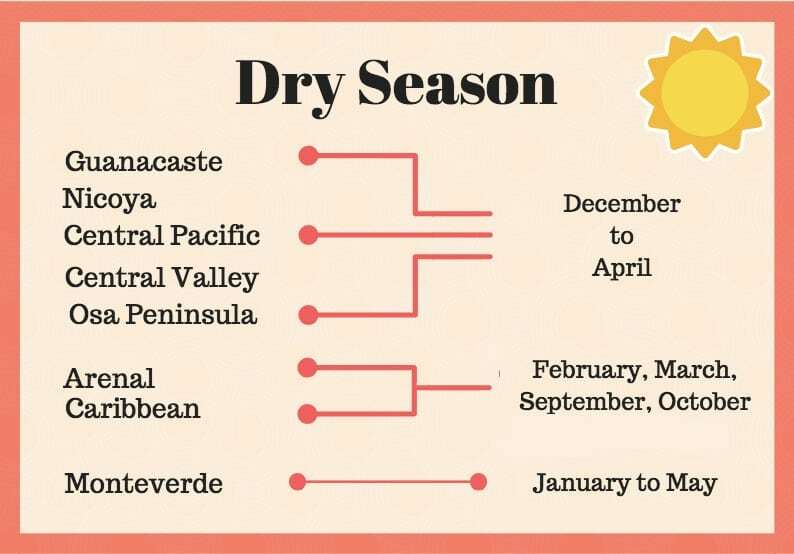 The dry season in the Guanacaste province, for example, is different than the dry season on the Caribbean coast. Another thing to take into consideration is that there are parts of the country that experience less rain than others and that have their own distinct weather patterns. The northern province of Guanacaste and the Nicoya Peninsula, for example, tends to be drier than other parts of the country. Monteverde Cloud Forest‘s dry season is delayed a few weeks and lasts from January to May. 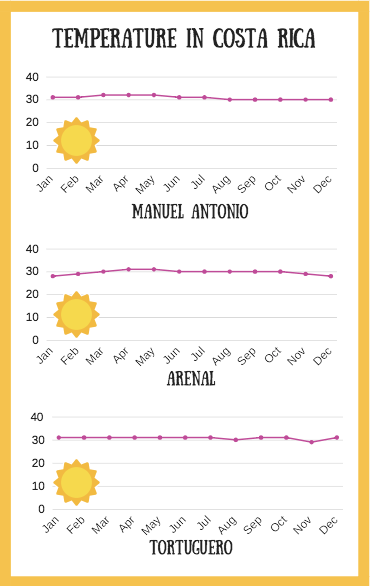 However, Monteverde is rainier and cooler than most parts of Costa Rica throughout the year. Moreover, the Caribbean tends to experience a “mini summer” in September and October when the rest of the country has the most rainfall of the year. 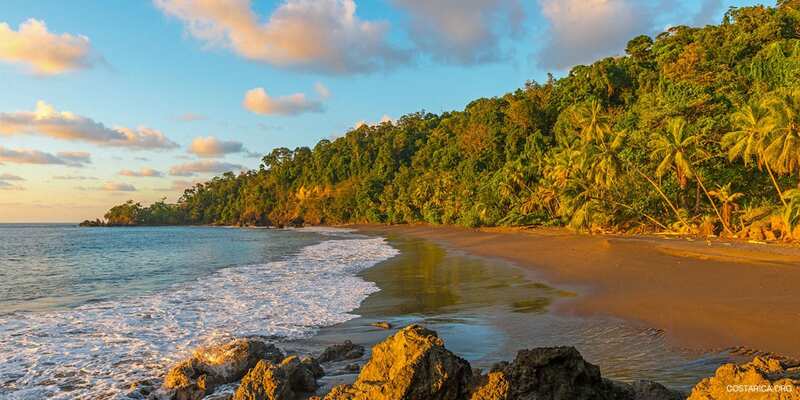 The Caribbean is the location of popular destinations such as Tortuguero National Park – where you can see an amazing array of wildlife – or Puerto Viejo, one of the most beloved beach towns in Costa Rica. The seasons near the Arenal Volcano National Park and La Fortuna, famous for its waterfall and hot springs, are similar to the Caribbean. The best time to visit Arenal is between September and October. So you see, the weather in Costa Rica is fairly complex and there is no one good time to visit all the destinations. The dry season usually is a great season to visit. Although, if you don’t mind a little bit of water then why not come down and enjoy the perks of the rainy season? For starters, it is much cheaper to fly between May to November than during the dry season (this is because the demand is way lower during that time). Another good reason to come during this time it’s what we call “the wonderful awakening of nature”. Everything seems to come to life and turn into a brilliant green, similar to the green you see when spring finally comes after a long winter. Animals, plants, and everyone else seem to enjoy the wetter part of the year. Regardless, traveling to Costa Rica will be an incredible experience. Even if some people prefer the dry season, you prefer the Costa Rica green season if you want to see lusher rainforests and dozens of different animals. In conclusion, the best time to visit Costa Rica depends on your preferences. Because of its location close to the equator, the climate in Costa Rica is tropical. The temperature in Costa Rica is basically the same all year round. The hottest month of the year is usually just about 3 degrees Celsius warmer than the coldest month of the year. The Temperature generally stays above 20 degrees Celsius (68°F) during the days and can reach into the 30s (~90°F) near the coast. This is a great temperature to enjoy the weather and scenery around you. However, the country has many microclimates. For example the weather in San Jose if famous for being an ‘eternal spring.’ Temperatures in San Jose are between 23°-26°C (73°-79°F) during the day and 15°-17°C (59°-63°F) at night. Popular beach destinations – such as Manuel Antonio, Tamarindo or Puerto Viejo – have temperatures of over 30°C (~90°F) during the day and around 22°C (71°F) during the night. On the other side, it is much cooler in the mountain ranges of the country. The cloud forest of Monteverde has an average high of 21°C (70°F) and an average low of 13°C (55°F). It can get even colder if you decide to hike to the top of a mountain. The Irazu Volcano, which is the highest volcano in the country, has a temperature of just 5°C (41°F) on some days! For an up-to-date weather forecast, click here! Rainfall is at its high during the green season but that shouldn’t prevent you from coming. In most parts of Costa Rica, the rainy season begins in May and reaches its peak in September and October. However, the rainy months are a mixed blessing and you should also note that the rainy season doesn’t mean full days of heavy rains. Most rain showers will appear in the afternoon. So, you can pack your mornings with activities like hiking and zip lining and leave the afternoons for relaxing. Of course, you also have to consider that the amount of rainfall depends on the region of Costa Rica which you are visiting. 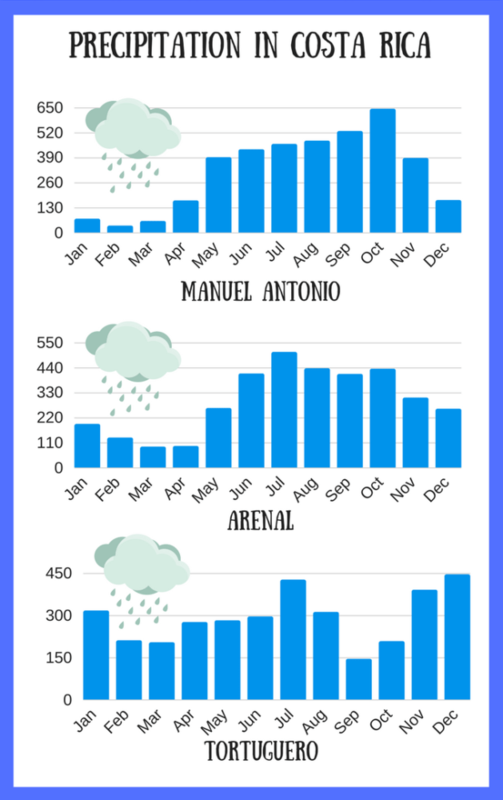 As you can see in the graphic on the right side, Manuel Antonio barely gets any rain from December to May. However, compared to other destinations in Costa Rica, there is a lot more precipitation in September and October. Tortuguero and the rest of the Caribbean experience more rainfall throughout the year, but have a dry period in September and October when it is very rainy in the rest of the country. Above all, the best time to visit Costa Rica is when you feel you want to come. Every time of the year has its advantages. There is no answer better than that it all depends on what weather you like and how much you want to spend! Christmas and New Year’s Eve clearly is not enough for Costa Rican’s, the party must go on! The Fiestas Palmares takes place in the last two weeks of January. The location of the festival is Palmares, close to the city of Alajuela. You can see concerts, stand-up comedy, sporting events, bullfighting and much more. The Envision Festival takes place close to Uvita, nestled between the ocean and the jungle on the Pacific coast. It is a celebration of the awakening of human potential. The Envision concept encompasses eight pillars: Music, movement, art, bio-construction, health, community, permaculture and spirituality. Another great attraction is the Limón Carnival, which is similar to the one in Rio de Janeiro. The Limón Carnival is full of dancing, colorful and expressive clothing, and a great spirit that fills the streets. This is a great way for a tourist to experience the Pura Vida of Costa Rica. One of the most famous festivals is the Fiestas Zapote. This marks the end of the year for Costa Ricans and is a big celebration with bulls running around a stadium. You can also enjoy fun music and lots of partying. 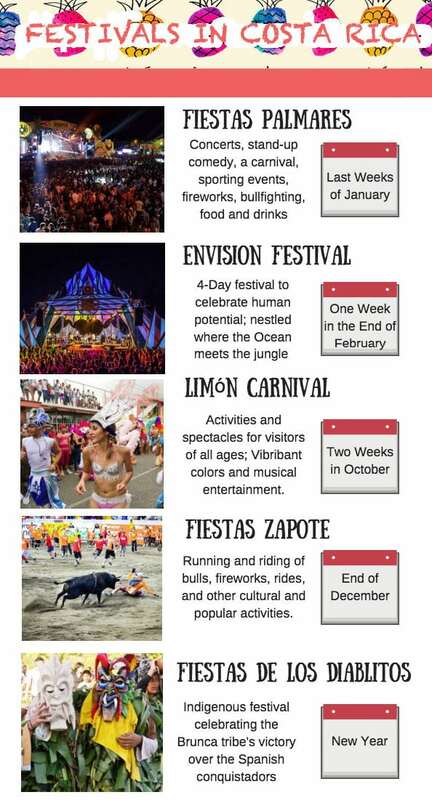 Fiestas Zapote starts in the last week of December and ends in the first week of January. Entire streets are blocked off, and the great smell of meat on a stick permeate through the area. The whole thing is broadcasted on television. The Fiestas de los Diablitos is at the end of December or the beginning of January. This annual event is held by the indigenous Brunca tribe. The Brunca celebrate the victory over the Spanish conquistadores and dress up as diablitos who represent the ancestral spirits. You can see dozens of indigenous Costa Ricans in self-made costumes and masks. In the end, a bull – representing the Spanish – is lit on fire. Fiestas Zapote – End of December and Start of the new year. The main species of whale that you will see in Costa Rica are the Humpback Whales, Pseudo Orca Whale, and Pilot Whale. 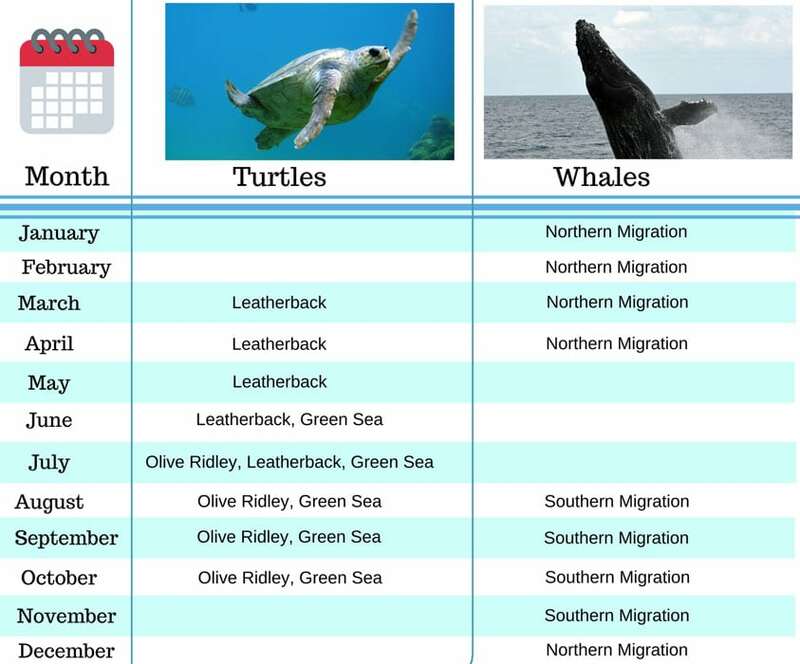 Northern Hemisphere whales show up like clockwork between December to April. This is one of the best times to visit Costa Rica as it is the dry season, the weather is gorgeous almost every day. Southern Hemisphere whales travel all the way from the Antarctic to Costa Rica between July and November. The best destinations to see them are Marino Ballena National Park and the Osa Peninsula. Not many people know this but there are several types of sea turtles that come to Costa Rica each year. The first one, and possibly the most popular, is the Olive Ridley Sea Turtle. The best place to see them is Ostional Beach where thousands of Olive Ridley’s migrate to every year. The other species in Costa Rica are Green Sea Turtle, Leatherback Turtle, and Hawksbill Turtle. All four species are labeled as endangered and need special protection. Other destinations to watch turtles include Tortuguero, National Park Marino Las Baulas, and Corcovado. Many birders consider the resplendent quetzal the most beautiful bird in Costa Rica. Therefore, it is a popular wish to see these magnificent birds while vacationing in Costa Rica. November to May is the best time to see them, but some travelers have luck during other months of the year. There are several places in Costa Rica where you could spot them but the best places are Monteverde and the San Gerardo de Dota area. People from all over the world travel to Costa Rica and go surfing to catch the best waves. Thanks to its 1,290 km (800 mi) of coastline, this tropical paradise is one of the best destinations in the world for this fun activity. December to April is the best time to go surfing on the Caribbean Coast while the conditions on the Pacific Coast are better from May to October. No matter when you decide to travel to Costa Rica, it is always surfing season! The best beaches include Puerto Viejo in the Caribbean as well as Playa Hermosa and Playa Pavones on the Pacific Coast. Costa Rica has become a major hub for sports fishing in the last decade. The dry season, which spans from December to April, is by far the best time to go fishing in Costa Rica. During this time, there is little to no rain and the water is clear. The best destination for sports fishing depends on which fishes you are looking for. However, one of the best marinas is definitely in Quepos. There is an amazing boat selection, beautiful landscape and – most importantly – a broad variety of fish species. In conclusion, the best time of year to visit Costa Rica depends on what you want to see and do! Whether you decide to visit during the rainy season or the dry season, you are sure to have a fantastic Costa Rica vacation. Lets My Costa Rica help you design the best vacation for you!